Valentine’s Day is easy for restaurants, hotels, and flower and candy shops, but what about businesses that don’t promote love and romance? With a little imagination, even businesses without a connection to the holiday can still create memorable online marketing campaigns using infographics, videos, social media promotions, and events. Here are 14 “unconventional” examples, meant to inspire. Death to Valentine’s Day: What Would It Take to Cleanup Infamous Crimes of Passion? Aftermath Crime Scene Cleanup specializes in crime scene cleanup and biohazard remediation. In 2014, the company decided to clean up the crime scenes of “romantic” couples untimely deaths: Romeo and Juliet, the movie “Obsessed” stalker Lisa’s death, Bonnie and Clyde, and the infamous ice pick murders in “Basic Instinct.” The problem and the solution are the featured content and illustrate that the company knows how to deal with the crime scene aftermath. Make Someone Fall For You Hook, Line and Sinker. Take Them Fishing or Boating – Or Both! The Recreational Boating & Fishing Foundation created an infographic called “Take Me Fishing,” which revealed that couples who go fishing or boating describe the experience as relaxing, playful, and romantic. While not released during February, the company could have indeed used it as a Valentine’s Day promotion. Statistics included in the infographic said that one-third of people in a relationship preferred non-traditional dates such as hiking or fishing and that 55.6 percent would go fishing or boating on a date. Clorox: Interesting Facts About Kissing. 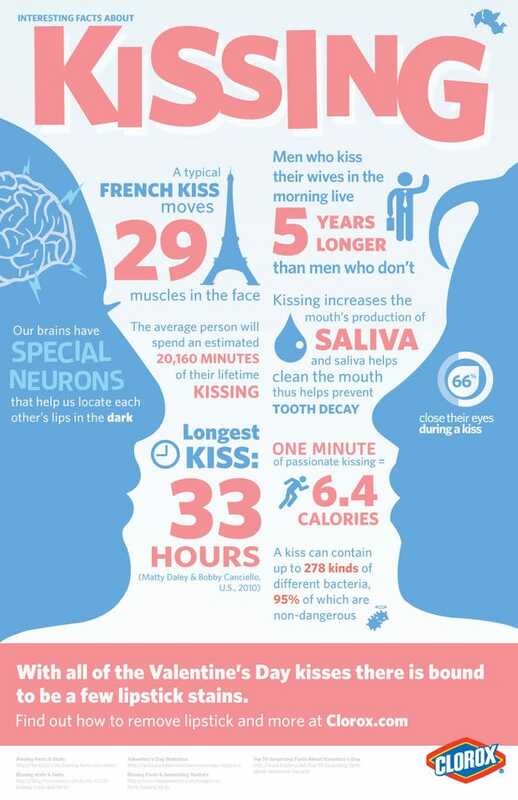 In this infographic “Interesting Facts About Kissing,” Clorox explores the role of neurons and muscles in kissing, finding that men who kiss their wives in the morning live five years longer than those who do not and that 66 percent of people close their eyes during a kiss. The infographic ends with this statement: “With all of the Valentine’s Day kisses, there is bound to be a few lipstick stains.” It then directs readers to the website, for lipstick removal advice. The infographic sums up Clorox’s unique take on Valentine’s Day and the opportunity it presents for using one of the company’s flagship products. Since 2014, Lake Shore Funeral Home in Waco, Texas, has hosted a banquet for local widows and widowers to come together on a day that can be hard for many to face alone. A video slideshow on the funeral home’s website features pictures of its 2015 event. Sweetheart Rose Garden Valentine Gift Package. It offers a professionally planned and planted garden, complete with ten rose bushes, installed in time for Mother’s Day. So that the recipient doesn’t miss out this Valentine’s Day, it plans to deliver a dozen roses along with the “Sweetheart Rose Garden” certificate. How to Avoid Feeling Flushed This Valentine’s Day. The toilet paper company, Charmin, presented an infographic focused on the theme, “How To Avoid Feeling Flushed This Valentine’s Day: Avoid Blunders That Can Ruin Everything.” Embarrassment, stress, and anxiety were themes, along with facts that include details on clogged toilets, sweaty palms, and silent moments during dinner conversations. Life Happens is a non-profit organization that educates consumers on insurance products and offerings. The infographic “Can You Insure Love?” looks at what people think they can insure and what motivates them to buy insurance. According to its research, 75 percent of buyers say the main reason they buy life insurance is because they love their family. Valentine’s Day: The Economics of Love. SaveUp is a prize-linked savings program that rewards members for saving money in return for the chance to win prizes. In 2013, it created an infographic “Valentine’s Day: The Economics of Love,” which encouraged members to consider the cost of a Valentine’s Day evening and the option of using that money for a down payment on a home. It also offered tips for low or no cost ways to spend the evening. Are you in love or in need of a root canal? Dental Newsweek, a magazine for the dental industry, shared a Facebook message with its subscribers that compared the symptoms associated with love to those of root canals. You’re smokin’, you’re hot, change your batteries, so your house is not! In 2015, Alexandra Friedman of The Corcoran Group, a real estate brokerage in New York City, sent a Valentine’s Day notice to her current and past clients that contained two batteries and a reminder to change their smoke detector batteries. The idea allowed her to remind her clients of her service and how to show love with safety. Fall in love with the best home warranty. Landmark Home Warranty, based in Utah, decided to take the concept of finding the right person to love and shift it to finding the right home warranty, to meet your needs. In an infographic titled “Fall in love with the Best Home Warranty,” prospects were asked if their current home warranty company gives them peace of mind, listens to them, keeps them warm at night, and communicates with them regularly. Love is like a roach. Both make the heart beat faster. New York City’s The Bronx Zoo chose a unique way to celebrate Valentine’s Day this year by giving people a chance to name a roach. As misunderstood love bugs, many roaches are nameless. For $10, a digital gift certificate is presented to your loved one with your roach’s name and, for $25, a printed certificate with chocolates is delivered to your door. Green Guide To Dating and Love. Flirtation, seduction, and passion were the inspiration for Timberland’s eco-friendly infographic “Green Guide To Dating and Love.” Turning off the lights and conserving water can spark intimacy. Other ideas included ways to make love grow and endure through supporting local organic efforts, recycling, and finding places to meet like-minded people.